Are you ready for this? Chocolate Orchids. When you smell these babies, you'll be hit by a wonderful chocolate scent floating up from dozens of tiny blossoms. Sharry Baby is spectacular in its festive splashes of chocolate and white. The flowers appear to be soft and delicate, but the petals actually have a firm, almost leathery feel to them. Just like chocolate, they can be very addictive. 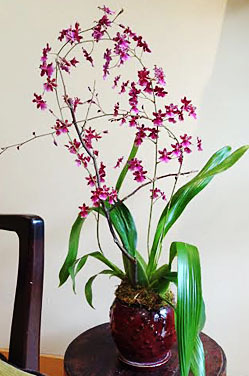 Whether you start your orchid collection with this beautiful Oncidium or your antique porcelain urn, you're sure to enjoy the results. For orchid container, view BASKET for more details. The plant stands approximately 2-3 feet tall and shipped with 1-2 spikes with approxiamtely 15-25 buds per spike. The blooms measure 1.5 inches in diameter.